Microbial safe drinking water is a major public health issue in the United States. Most water treatment plants use chlorine as both a primary and secondary disinfectant. Primary disinfection inactivates disease-causing pathogens while secondary disinfection maintains chlorine residual throughout the water distribution system. This disinfectant residual prevents microbial outbreaks caused by leaking pipes, microorganism infiltration, low pressure, and pipe-wall reactions. Most water treatment facilities apply a high chlorine dose to the water guaranteeing that both primary and secondary disinfection requirements are met. Booster chlorination decouples these requirements by adding a dose at the plant to achieve microbial inactivation and a supplemental, or booster, dose out in the distribution system to maintain the proper chlorine residual. Chlorine reacts with microorganisms to produce safe drinking water, but chlorine can also react with natural organic matter to produce harmful disinfection by-products. Disinfection By-products have been classified as possible carcinogens by the Environmental Protection Agency. 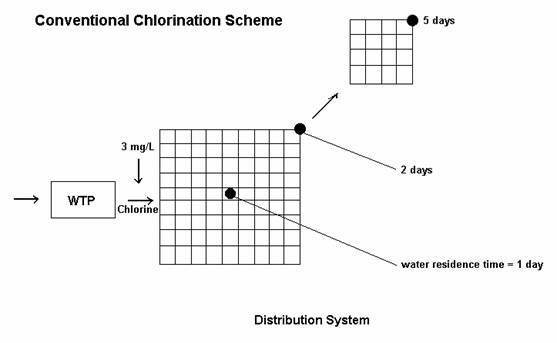 Since a larger chlorine dose produces more disinfection by-products, booster chlorination could potentially lower the disinfection byproduct exposure risk to the population defined by a specific density function. In anticipation of extensive suburban and urban sprawl, booster chlorination may become an invaluable method of decreasing the disinfection by-product exposure risk to humans as well as decreasing the chlorine mass required to produce microbial safe drinking water. Drinking water disinfection has been a major issue in the United States public health arena. Chlorine is the primary disinfectant used in the U.S. It is a strong oxidant that inactivates microorganisms and pathogens that can potentially cause waterborne disease outbreaks. Chemical disinfectants are readily used to produce microbially safe drinking water. Although chlorine efficiently oxidizes pathogens that can cause waterborne diseases, it can also react with natural organic matter (NOM) to produce disinfection by-products (DBPs). Half of these DBPs consist of trihalomethanes (THMs) and haloacetic acids (HAAs). The United States Environmental Protection Agency’s initiation of rigorous maximum contaminant levels (MCLs) on disinfection by-products (DBPs) has given water treatment plants (WTPs) the difficult task of balancing acute microbial contamination risk against the DBP chronic exposure heath risk. It is difficult to determine the chlorine dose for a WTP because of system requirements. The chlorine dose must be high enough to produce microbial inactivation (primary disinfection) as well as residual maintenance throughout the distribution system (secondary disinfection). It also must be low enough that the formed DBPs conform to the DBP Rule, taste thresholds, and odor thresholds. The Stage I Disinfection By-Products Rule (DBPR) established maximum contaminant levels for four trihalomethanes and five haloacetic acids (USEPA, 1998). Residual maintenance refers to a trace amount of chlorine in the distribution system that protects the water from pathogen infiltration due to leaking pipes, low pressure, or wall pipe reactions. In conventional disinfection, the initial chlorine dose must meet both primary and secondary disinfection requirements. In another approach termed booster chlorination, primary disinfection requirement is separated from the residual concentration requirement. The initial chlorine dose at the WTP inactivates the pathogens while the booster disinfectant dose sustains the chlorine residual within the distribution system. This decoupling decreases the amount of DBPs that are formed from the initial disinfection dose. The Center for Drinking Water Optimization research group explores short-term chlorine decay; short-term formation rate of disinfection by-products, treatments including ozonation-biofiltration, granulated activated carbon, and membrane filtration; chloramine disinfection, and pre-oxidant analyses. Conducting experiments on the major components in a full-scale water treatment plant will dictate the optimal treatment process. An optimal water treatment process being defined as one that produces sufficient microbial disinfection, adequate disinfectant residual throughout the distribution system, and compliance with DBP maximum contaminant levels. It is important that the water treatment not only provides disinfection, but also maintains a residual that will inactivate pathogens that enter the water distribution system through pipe leaks and NOM reactions on pipe walls. Most water treatment facilities have sought to meet these needs by applying a disinfection dose that is large enough to maintain chlorine residual for the consumers on the distribution system periphery. Recently, increasing concern with disinfection by-products and the epidemiological and toxicological studies linking these compounds with spontaneous abortion and cancer has caused further scientific exploration of the connection between chlorine disinfection of disease-causing pathogens and the formation of harmful and potentially carcinogenic DBPs. This booster chlorination system design separates the microbial disinfection from the formation of DBPs. If waterborne pathogens are such a tremendous public health risk, why is there such concern with THMs and HAAs? A study on the health effects of disinfectants and disinfection by-products established these chemicals as suspected carcinogens (Uber et al., 2001). There have also been toxicological studies linking DBPs to spontaneous abortion (Uber et al., 2001). Because of its threat to public health, it is important that the DBP concentrations are reduced as much as possible without sacrificing the safety of the drinking water. Utilizing a booster chlorination scheme effectively maintains distribution system residuals while decreasing the concentration of total trihalomethanes (TTHMs) (Uber et al., 2001). For example, a conventional system (Figure 1) might add 3 mg/L Cl2 at the WTP. This high disinfectant dose must be enough to provide a sufficient residual for the consumers on the system periphery. Usually the minimum residual (0.2 mg/L) occurs at the location with the maximum residence time (5 days), so the disinfectant dose must be enough to last until the periphery residences. The TTHM formation for the conventional system, where the maximum residence time is 5 days and the initial dose is 3 mg/L is shown along with chlorine decay in Figure 2. The portion of the population that consumes water with an ‘age’ of 1-2 days is exposed to high concentrations of DBPs (60-75 mg/L). In a booster scenario, assuming the mass additions and flow rates for both systems are equivalent, 2 mg/L is added at the plant and an additional 1 mg/L after the water has aged 2 days, so the population receiving 1-2 days old water is exposed to decreased THM concentrations (35-60 mg/L). 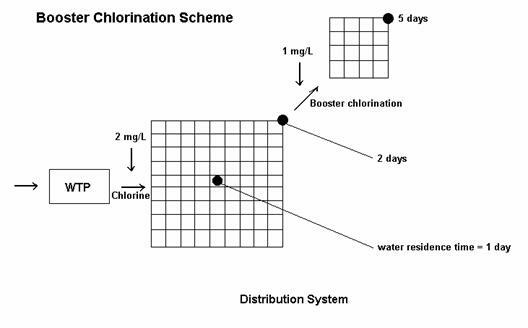 Figure 4 shows the chlorine decay rate and the TTHM formation rate for the booster chlorination system. The initial chlorine concentration is 2 mg/L at its entrance to the water distribution system. The disinfectant quickly decays to a small, yet sufficient residual (0.25 mg/L) in 2 days. The 2-day-old water receives more chlorine through a booster dose that immediately increases the concentration to a little over 1 mg/L. The chlorine decays to a minimum residual level of approximately 0.2 mg/L at the maximum residence time (5 days). Figure 4 indicates the TTHM concentration rate for two different conventional systems: one that produces a final TTHM concentration of 100 mg/L and one with a maximum concentration of 80 mg/L as well as a booster chlorination system (dotted line). The TTHM concentration for the booster system initially demonstrates 80 mg/L curve behavior, but finishes at a concentration of 100 mg/L. Although the maximum concentration was the same value, the TTHM concentrations from 1-4 days were much lower than the TTHM concentrations on the 100 mg/L curve. This research project falls under the auspices of the Center for Drinking Water Optimization. This EPA funded research initiative, directed by R. Scott Summers, conducts research on the chemical and physical processes involved in water treatment plants (WTPs). This research project will include both laboratory experiments and mathematical modeling. Using bench scale treatment, water samples will be treated with booster chlorination techniques. The water samples will receive an initial concentration of chlorine to neutralize the microorganisms and an additional dose after 48 hours have passed. Increasing the chlorine dose has been shown to increase the chlorine decay rate (Summers et al. 21). It has also been observed that the formation rate of THMs increases with an increase in chlorine dose. Through chlorine residual measurements and gas chromatography, the chlorine decay rate and the formation rate of disinfection by-products can be determined for various times following the water’s release from the water treatment plant or various locations within the water distribution system`. Using several experimental samples should yield a balance between the required chlorine residual and an allowable concentration of DBPs. Mathematical models will be used to calculate the risk associated with these DBP concentrations, such as a log normal distribution function for water age within the distribution system. These risk factors can be applied to distribution systems with various population densities in order to determine DBP health risk to drinking water consumers. It is hypothesized that booster chlorination will lower the DBP exposure risk to the human population. A higher chlorine dose produces more disinfection byproducts, so it is concluded that the booster chlorination method will yield lower DBP concentrations at average times in the water distribution system. On average, the drinking water population will be exposed to lower concentrations of DBPs, although the maximum concentration may be equivalent to the high disinfectant dose situation. The concentrations of three THMs, dichlorobromomethane, chlorodibromomethane, and bromoform can be related to human health risk through toxicological studies in order to quantify the health risk levels produced by the booster chlorination method. For this study, water will be collected from the City of Boulder’s (Colorado) 63rd Street Drinking Water Treatment Plant influent. The raw water will be filtered through a 1-μm cartridge filter. After the initial filtration process, the water will be enhanced coagulated, flocculated, and settled, then filtered through a 1-μm cartridge filter. The alum dose used for enhanced coagulation will be determined from jar tests performed on 63rd Street Drinking Water Treatment Plant influent. This study will utilize two different NOM characteristic waters: one water sample with low total organic carbon (TOC) and one sample with high TOC. The low TOC water used will be the enhanced coagulated raw water from the 63rd Street Drinking Water Treatment Plant influent and the high TOC water will be the enhanced coagulated raw water spiked with NOM. The low TOC water will be 1.5 mg/L and the high TOC water will be spiked to 5 mg/L. In order to determine the chlorine dose for each experimental run, chlorine demand study will be performed. A demand study entails the addition of five different chlorine doses to five bottles containing enhanced coagulated water. Once the chlorine dose is added, the bottle will be capped, inverted several times, filled the rest of the way with water, and capped headspace free. The chlorine will be allowed to decay for one day. The chlorine residual concentration remaining after one day will be measured for each of the five bottles. The chlorine doses will be plotted against the chlorine residuals to obtain a linear relationship. The slope of this line can be utilized to determine the exact chlorine dose required for a chlorine residual of 0.3 mg/L at 1 day. This same technique will be applied for the 2 day and 10 day chlorine demand tests. For each chlorine decay and TTHM study, a one-half gallon amber bottle (the exact volume known) will be filled three-quarters full of water. The chlorine dosing solution will then be added to the bottle to obtain a specific initial chlorine concentration using a 1.00 to 5.00 mL pipette. The cap will be placed on the bottle and it will be inverted twice to mix the chlorine dosing solution uniformly in the water. The bottle will then be filled the rest of the way with water and capped headspace free. For the chlorine decay and TTHM studies of the high dose (chlorine dose that will result in a 0.3 mg/L residual at 10 days), the water will be poured into 4 oz. bottles, headspace free. The chlorine residual measurement from a 4 oz bottle will be taken at each of the following reaction times: 1 hour, 2, 4, 8, 24, 120, and 240 hours. The TTHM measurements will be quenched with ammonia chloride (65 mg/40 mL) at the same reaction times. The same procedure will be performed for the 1 day chlorine residual dose (dose that will result in a 0.3 mg/L residual at 1 day) and the 2 day chlorine residual dose (dose that will result in a 0.3 mg/L residual at 2 days). For the 1-day booster chlorination measurements, the initial chlorine dose will be added as specified previously, but the water will not be immediately poured into smaller bottles. The one-half gallon amber bottle will remain capped for 24 hours. At that time a booster chlorine dose will be added, then the water will be poured into individual bottles for chlorine decay and TTHM formation analysis. The chlorine measurements will be taken at 1 hour, 2, 4, 8, 24, 96, and 216 hours. The TTHM measurements will be quenched at the same times. The same procedure will be used for the 2-day booster chlorination measurements except that the water will remain in the one-half amber bottle for 48 hours before it will be dosed and poured into individual bottles for chlorine and TTHM measurements. The chlorine measurements and TTHM quenched measurements will occur at the reaction times of 1 hour, 2, 4, 8, 24, 72, and 192 hours. The chlorine decay and TTHM studies will be conducted using the following base conditions, which model operation conditions: temperature of 20ºC and pH of 8.0 (buffered). The chlorine dosing solution and the water must be buffered to pH of 8.0. The chlorine dosing solution will be made from concentrated 4-6% sodium hypochlorite and pH 6.7 borate buffer in laboratory clean water to achieve 4 to 7 mg/L Cl2, buffered at pH 8.0. The chlorine dosing solution strength will be measured by the iodometry method, SM 4500-CIB. The chlorine residual will be measured using the DPD-FAS SM 4500-CID and TTHM will be measured using U.S. EPA Method 551.1. This booster chlorination distribution system may not decrease the maximum level of DBPs in drinking water, but it may prove to substantially lower the health risk for consumers within the water treatment plant’s vicinity. Epidemiological and toxicological studies link disinfection by-products with cancer and pregnancy loss. Decreased DBP exposure for a population and consequently decreased environmental health risk would be an invaluable practice. In addition to lowering the DBP exposure for the population segment preceding the booster chlorination site and maintaining an adequate chlorine residual, this booster disinfection water distribution system may decrease chemical costs for specific water distribution systems with significant suburban or urban sprawl. Summers, R. S., Dickenson, E., and Work, L. “Short-Term Chlorine Decay and Disinfection By-Product Formation,” Department of Civil, Environmental, and Architectural Engineering, University of Colorado, (2002). Uber, J.G., Summers, R.S., Boccelli, D.L., and Tryby, M.E. Maintaining Distribution System Residuals Through Booster Chlorination , Awwa Research Foundation and American Water Works Association, (2001). USEPA. National Primary Drinking Water Regulations: Disinfectant/Disinfection Byproduct Final Rule. Federal Register, (1998). Water Quality and Treatment. 5 th edition. Edited by Raymond D. Letterman. (1999). Low Bromide Water: Species composed of one or more bromine atoms were only found in trace amounts. For both experimental scenarios, High Dose and Boost Dose, the water was dominated by chloroform, which contains no bromine atoms, and small concentrations of dichlorobromomethane, which contains one bromine atom. There were only trace amounts of chlorodibromomethane and bromoform. It is concluded that the Boost Dose scenario is equivalent to the High Dose scenario with respect to THM exposure risk. High Bromide Water: Dichlorobromomethane was the dominant THM species followed closely by chlorodibromomethane and chloroform. It is concluded that the Boost Dose scenario is equivalent to the High Dose scenario with respect to chlorodibromomethane concentration. The Boost Dose scenario yields a greater risk for exposure to bromoform and a decreased risk for exposure to dichlorobromomethane.